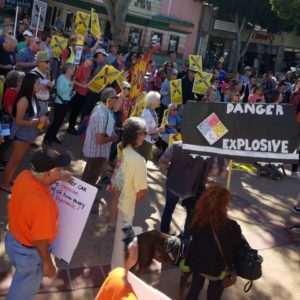 Dozens of people protested Philips 66’s planned Nipomo rail spur both inside and outside of the San Luis Obispo County Board of Supervisors chambers on Monday. This week, the board of supervisors is holding a series of appeal hearings in which Phillips 66 is contesting the county planning commission’s decision to reject the rail spur project. The first hearing took place Monday and consisted primarily of public comment. Philips 66 aspires to build a rail spur so that crude oil currently delivered by pipeline can be transported to the Nipomo Mesa refinery by train. Project plans call for a maximum of 150 trains a year to pass through SLO County to the Mesa refinery. Each train would consist of up to 80 railcars, which could each transport about 27,300 gallons of oil. Last April, following eight months of its own hearings, the county planning commission voted 3-2 to reject the project. Phillips 66 responded by appealing the ruling to the board of supervisors, but also by filing a lawsuit. The lawsuit alleged the planing commission misapplied county land use rules in designating a location to be an environmentally sensitive habitat. Attorneys for Phllips 66 argued the planning commission made the designation after the rail spur project was already accepted, violating a land use ordinance deadline and wasting the company’s time and money. Last week, a San Luis Obispo judge rejected most of the oil company’s claims, ruling that the issue of whether or not the planning commission based its decision on a valid finding is a matter that should be addressed by the board of supervisors before the case comes to court. On Monday, opponents of the project came from across the state to demonstrate in downtown SLO. The protests were led in part by San Luis Obispo Mayor Heidi Harmon. “Hey Phillips. What do we know? No trains in S-L-O,” protesters chanted outside the county courthouse. Inside the county chambers, Board of Supervisors Chairman John Peschong recused himself from the Phillips 66 hearings. Meridian Pacific, Peschong’s consulting firm, received $262,000 from the oil company in 2015. In place of Peschong, Supervisor Adam Hill is serving as board chairman. Public comment on the rail spur project will continue on Tuesday. The board of supervisors may rule on the project this week. If there is a 2-2 vote, as many observers suspect there will be, the planning commission decision to deny the project will stand. If that occurs, Phillips 66 could take the case back to court. No pipelines, no trains, no trucks, no oil. We starve. Pretty simple really. so, according to the press most of these people (NOT ALL) have come to SLO on buses from Northern California (Bay Area) where all the crazy liberals reside and whose sole purpose is to do away with fossil fuel. I am 100% for safety but I would rather have it on trains then highways, 250 truck loads a week on our local highways or 3 trains a week. My dad in the 50’s worked at the Nipomo Mesa Plant (I believe it was a Unocal at the time) and I don’t recall any major issues with that plant all these years. That is a fact! No, “I don’t recall” is not a fact, never was. Why would anyone support more tanker truck on California maintained highways when the there is a private rail system option. If people fined the rail system to be unsafe, why haven’t they addressed that as an ongoing issue for the existing oil tankers. All transportation safety issues are important and should be reviewed on a regular basis. Folks like me have, time-and-time-again! But those we are fighting have all the resources and political backing to make our efforts go away, quickly! The world is ran by and is run on big oil, a combination that doesn’t bode well with any change outside of their preferred product(s). If you want an interesting read on how this type of power manifests itself try ” General Motors Streetcar Conspiracy” and you’ll read about the collusion that wiped out the true affordable cleaner transportation option this country once had. Beside, it’s much cheaper for big oil to pay off settlements and law suits than it would be for them to introduce new tanker cars and or truck tanks that are safe and reliable, MUCH CHEAPER! The “General Motors Streetcar Conspiracy” I refer to is not some theory, nope! It’s a fact proven in court with penalties doled out to the perpetrators. Read about it and then tell me I’m wrong. It’s the way our country is run; less accountability and retribution to those best financially able to both effect change or pay for it if they don’t!